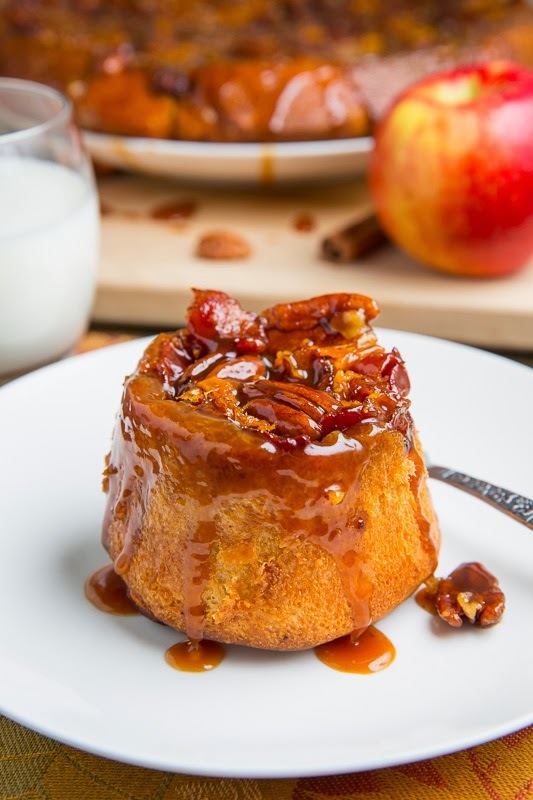 Pecan sticky buns with apple, cheddar and bacon make for a perfect blend of sweet and savoury in a tasty fall breakfast treat. One of the best things about fall is that it is apple season and this year I discovered a tasty new apple, the SweeTango apple! The SweeTango apple is a cross between the Honeycrisp and the Zestar and they have the best qualities of both of them! SweeTango apples are grown in a few states in the US and a few provinces in Canada and they are only available for a few short months in the fall. After enjoying snacking on some SweeTango apples it was time to put them to the test and use them in a recipe and the first recipe on my list to try was some SweeTango apple pecan sticky buns! Apple pie has to be one of my all time favourite things and I was a kid when I first came across the idea of serving apple pie covered in cheddar cheese. It wasn’t until a few years later until I finally embraced the idea of combining sweet and savoury by adding cheddar cheese to apple pie and to my surprise I found that the combination was amazingly good. 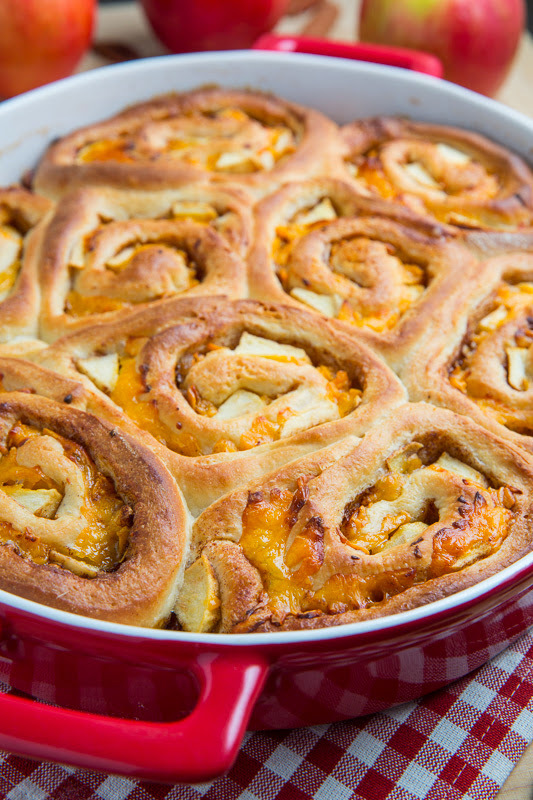 When I first got my hands on some of the SweeTango apples I could not resist using them to make some apple pie inspired pecan sticky buns and I just had to try throwing some cheddar cheese into the sticky buns! 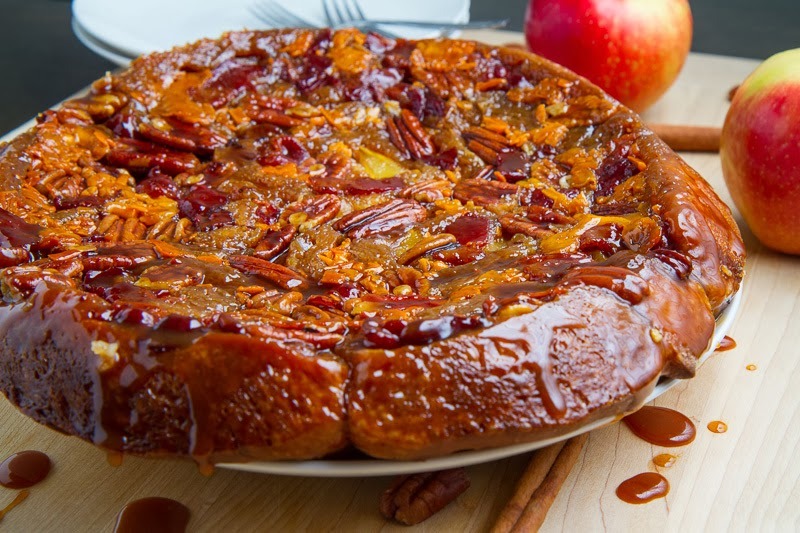 As you know, I am a complete bacon addict and I just had to try adding some bacon to the apple pecan sticky buns since bacon goes so well in sweet dishes and when combined with both apples and cheddar cheese. Since you need to let the dough rise two times, these sticky buns require a bit of time to make but they are actually pretty easy requiring very little actual work. One of the great things about making these sticky buns is the amazing aroma that fills the house while they are baking and it only heightens the anticipation! These SweeTango apple, bacon and cheddar pecan sticky buns turned out amazingly well! The sweet and savoury combo of the SweeTango apples and caramel when fantastically well with the melted cheddar and bacon! The SweeTango apples themselves worked really well in this baked dish and I can see myself using them in many more! My largest baking dish was not big enough to fit all of the buns so I placed the extras in ramekins and they turned out nicely! 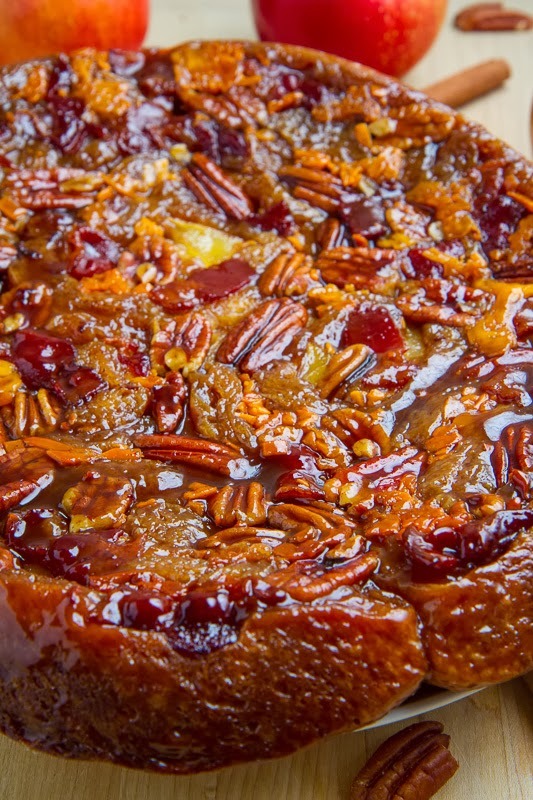 These apple and cheddar pecan sticky buns are just dripping in caramel! Just look at all of that melted cheddar goodness! Looking for SweeTango apples? Here in Canada you can find them in Loblaws, Sobeys and Walmart. Mix the water, yeast and sugar into a large bowl and let it sit until it is foamy, about 10 minutes. Add the sugar, eggs, butter, sour cream, vanilla, salt and 2 cups of flour, mix for 2 minutes at medium or 200 strokes by hand and stir in enough of the remaining flour to make a soft dough. Place the dough onto a lightly floured surface and knead until smooth, about 5 minutes. The dough should feel soft and buttery and not sticky. Place the dough in a large greased bowl, cover with a damp towel and let rise until it has doubled in size, about 1 hour and 30 minutes. Punch the dough down, knead for 30 seconds, cover rest for 10 minutes. Roll out the dough on a floured surface into a 16″ by 12″ rectangle. Spread the butter onto the dough leaving 1 inch of one of the narrow edges free. Sprinkle the mixture of the brown sugar and the cinnamon onto the buttered part of the dough followed by the apple, cheddar and half of the bacon. Roll the dough into a log starting with the buttered narrow end, pinch the seam to seal and cut into 16 even slices. Melt the butter, brown sugar and corn syrup in a pan at low heat, mix in the nuts and remaining bacon and pour the mixture into the bottom of the baking dish. Arrange the buns on top of the mixture, cover in plastic wrap and let rise until doubled in size, about 1 hour and 30 minutes. Bake in a 350F/180C preheated oven until golden brown, about 20-30 minutes. Disclaimer: This post and the SweeTango giveaway were sponsored by SweeTango. All Opinions are my own. What a perfect combination of ingredients! Love this one! These look incredible! I have been wanting to make sticky buns, but I am honestly not sure anything can beat this recipe. They look so sticky and delicious! You have outdone yourself with this one, Kevin! These sticky buns look ooey, gooey and absolutely perfect! I can't wait to try those apples. Honeycrisp are a favourite around here. Love SweeTango. And love that my alma mater, the University of Minnesota, keeps coming up with such great new apple varieties! This would be perfect at Thanksgiving celebrations ~ and before! My family grows organic Sweetangos in Washington state. This recipe sounds really fun! 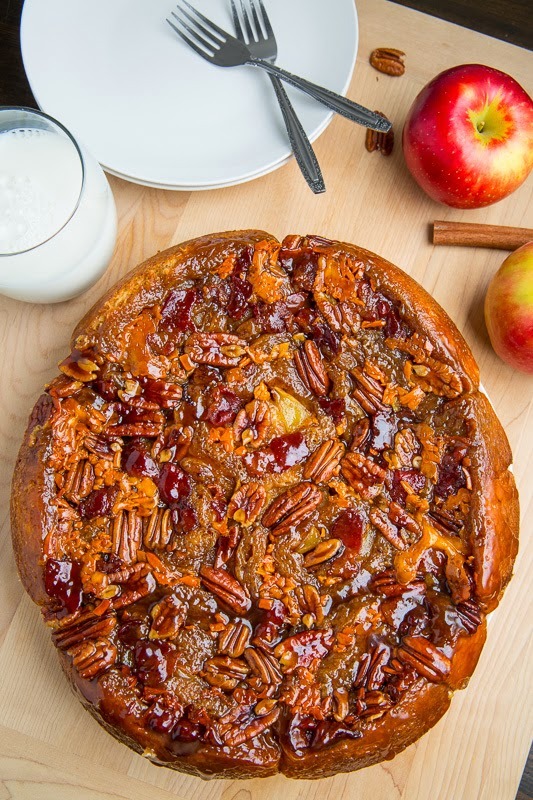 I've never heard of this kid of apple or thought of making a savory sticky bun. This is great! Wow what a unique idea! Stunning! Sounds like the perfect sweet and savory combo! Just in time for Fall! My coworkers would love me if I brought these to work for them! Orchards around here don't have sweetangos. will have to try Whole Foods. I seriously cannot even get over these. totally amazing Kevin! I have a bowl of Sweetangos on the island in my kitchen. I'm going to have to make this! Brilliant!!! These sound awesome !!! Love your recipes!!!!! These sticky buns are perfect for fall! I love the gooey goodness dripping down the sides of the buns. I'll have to try these. OMG!!! I LOVE STICKY BUNS!!! I can not wait to make these!! I believe you have reached the top of the ladder here, sir. If I were queen! I would knight you. ???????????? OMG could you make these anymore scrumptious? Just reading the title of these I feel like I'm in heaven. Now I'm going to have to make these. Fabulous recipe! I am so happy you added the bacon!!! And I hope mine look as good as yours do!…Amazing circles of YUM. And the apples will be fabulous. Apple pie is my favorite dessert, these sound amazing. These sticky buns look amazing! I love that you made them savory too! man o man these are crazy amazing looking! This looks so good! I can't wait to make this for my family. YUM!! I love the new SweeTango apples! They are so crisp and delicious. These sticky buns look heavenly! OH MY!!! These look INCREDIBLE!!! 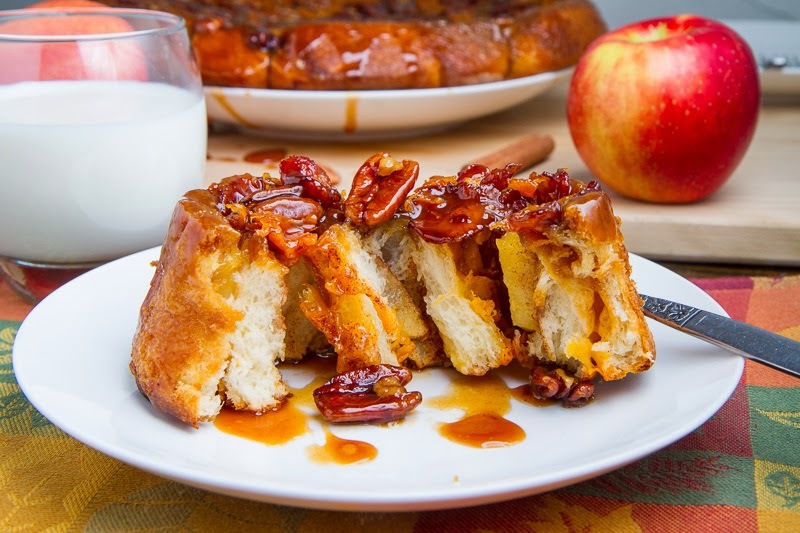 This is definitely an over the top sticky bun and I am absolutely making them!! This reminds me of my Grandpa – he'd always melt cheddar cheese on apple pie. Trust me, SweeTangos are everything the hype says they are. I want more! Never tried cheese with apples before in a baked dish but the rolls covered in gooey carmel is definitely a welcome sign. Any chance these are freezable or the recipe is easily halved? Looks like it makes it a huge batch. Like all your other recipes…… your pictures are amazing! What a awesome looking dessert … I can see myself sit by the fireplace and bit into one of this with my coffee. What a awesome looking dessert, I can see myself sit by the fireplace and bit into one of these with my coffee.